Jeanette, the blogger behind the always flawless the-swatchaholic.com was one of my very first nail crushes and since I began blogging, she slowly became one of my partners in crime. Our mission is to raise awareness of ovarian cancer. How? By painting your toenails teal, the ovarian cancer color. By getting your friends to paint their toenails teal too, and then by talking with people when they ask about it, to make sure that they know the signs of this whispering killer. 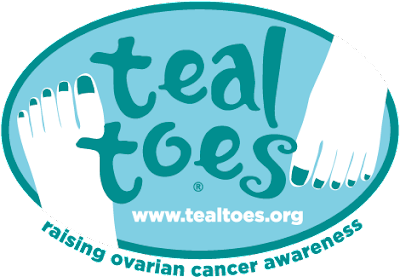 For more information, see www.TealToes.org. I saw this on her site and am dying!!!! Please mix me up a batch and send it to me!! I am literally drooling over this! Your nails are always so pretty and am jealous of your perfect smile lines-wish I could do that!!! Stunning!!!! Love love love your blog! Wow! Is Yves Saint Laurent Wintergreen as teal as it looks? The combo is gorgeous! @Fingers @Polish AMOR *blushing* thanks girls! Saw you over there and left my comment about your amazing franken. Wear teal folks!!! Get the awareness going. Pink worked for Breast Cancer and started grass roots just this way - Teal can do it with a lot of our help for Ov CA. Thanks for posting about the teal toes! I just discovered this and i think it's quite important! My aunt just beat ovarian cancer.